In yesterday’s episode, we saw the beginning of Vicki’s witchcraft trial, the first example of any kind of sustained legal procedure on Dark Shadows. And this is an odd moment for them to be apprehending suspects, because the 1795 storyline is basically the moment when we say goodbye to law enforcement in Collinsport. When they get back to the present day, we’ll see a few scattered appearances of the useless Sheriff Patterson and his even more useless successors, but they don’t amount to much, unless you count rising from the dead as a zombie and then being torn apart by a werewolf. But in 1795 — even with a whole subplot involving a trial and a prison term — we don’t see a single police officer. There’s a couple jailers, a few judges and an executioner hanging around in the back somewhere, but there’s nobody representing the police force. In fact, the main characters don’t even consider calling in the police, despite the sudden rash of suspicious deaths in and around the grounds of the Collins estate. Of all the unexamined crimes we’ve seen lately, the most egregious example is the murder of Suki Forbes, who was strangled by a vampire in the Old House while she was waiting for her estranged husband, Nathan, to join her for a secret assignation. Nathan arrived on the scene just a moment past the nick of time, and found her quote-unquote “already dying”, which is quote-unquote an “enormous coincidence”, and there’s no reason why anyone else on the show should believe it for a split-second. As Joshua pointed out when they were visiting the crime scene, Nathan is the only person with any ties to Suki. In any normal universe, Nathan would be the prime suspect — in fact, the only suspect — and should already be in police custody. And yet nobody sends for the constabulary. But Dark Shadows has lost interest in forensics, and with good reason. They gave police work a fair shot during the early Barnabas storyline, and it just didn’t work out. By now, they’ve given it up completely. There are several reasons for the show’s loss of faith in the justice system. For one thing, bringing in the police slows everything down. In a medium where car chases are out of the question, law enforcement activities take forever. Police sequences usually take place after the crime has already occured, when the assailant is off-screen somewhere, blending in with the underbrush. If you can’t do high-speed pursuits, then police work is basically just a gradual accumulation of facts — examining the physical evidence, talking to witnesses, checking alibis and sending things to the lab. So if you see a cop on screen in a non-cop-oriented soap opera, then you know it’s safe to fast-forward, because the very presence of the police officer is an inhibiting factor that gets in the way of the crazy people doing the crazy things that they should already be in jail for. The second problem is that the police close off story options. In the real world, I’m not going to haul off and punch somebody in the chops, because real-world law enforcement takes a dim view of that sort of behavior. That’s a good thing, obviously, because I don’t want to get punched either, and that’s how we encourage a chops-punching-free lifestyle, which is what I prefer. But if I’m watching a TV show, there’s no reason for me to sit there and watch a character not do something. In real life, I see people not doing things all the time; it’s not gripping. The fictional TV world is supposed to be my recklessness simulator. For example: Here’s Millicent taking the law into her own hands, and expressing her feelings through the medium of a letter opener. This is the kind of thing we’re here to see. And besides, soap operas aren’t the same as mystery shows. There are lots of very successful television shows about detectives, forensics investigators, and elderly mystery writers who just happen upon a dead body every single Sunday night for twelve years, but that story structure just doesn’t work when you try to graft it onto a traditional daytime soap. The key to a mystery/detective story is that there’s crucial information that the audience doesn’t know. For the most part, we see things from the investigator’s point of view, and all we know is what they’ve uncovered up to that point. There are exceptions — we usually see little slivers of flashbacks, or an opening teaser showing the crime being committed — but they’re always carefully staged so that you see the bad thing happen, without seeing who done it. That structure puts the audience on the investigation team, which makes the slow accumulation of facts interesting for us to watch. Every piece of evidence that the detectives uncover gives us new information, and pushes the story forward. Now, personally, I don’t think that makes those shows interesting enough to watch, but apparently people in nursing homes do, and that explains the entire CBS prime-time schedule. But the narrative structure of a soap opera is the exact opposite. The audience sees everything on a soap opera. This is partly based on the mechanics of soap production — if you have to deliver an episode every single day, you can’t have one main character who appears in every episode. You’d burn out the actor, and the audience would get bored. Instead, soap operas are structured around a loose collection of contract and recurring players who share screen time and storyline focus between them, so the show can’t sustain that sense of audience identification with an investigation team. Besides, soaps are built around showing us personal, intimate moments. We don’t just see characters during the high-drama moment of their lives; we see them going to the gym, and eating lunch. On an hour-long daytime soap opera, you’re guaranteed to see characters sitting down to at least three different meals in a given week. No other genre does that, keeping the audience in super-close touch with practically everything the characters say and feel. So we can’t just follow the detectives as they uncover the secrets of the supporting cast. We already know all the secrets; we were there when it happened. Watching the police investigate a crime that we already know about is just tedious. The only time that soap operas limit the audience’s access to information is when they decide to do an official “murder mystery” or “serial killer” storyline, which is a terrible idea that never, ever works. They’re just trying to swim upstream, following a narrative structure that’s completely oppositional to the rules of good soap opera. Finally, the last reason why law enforcement doesn’t work on a soap is that the response to a crime needs to feel satisfying for the audience on an emotional and aesthetic level, and arresting a character is never going to be the most satisfying resolution. For example, take Barnabas shooting Jeremiah in the duel a couple months ago. Barnabas was punished for doing that in several ways. Josette was tied even closer to Jeremiah after his death, because she had to honor his memory. Barnabas felt guilty for killing someone that he loved. And most importantly, the duel was another misstep that brought Barnabas closer to his death, and his transformation into a vampire. Imagine what that story would have been like if — instead of all of those emotion-driven, character-based consequences — they’d brought in some random Sheriff character to examine the body, look for the weapon, question all the witnesses, and finally arrest Barnabas and put him on trial. That would take weeks, and it still wouldn’t feel like anything. The Barnabas/Jeremiah duel is the stuff of Shakespearean tragedy — the uncle bewitched into stealing his beloved nephew’s fiancee, the nephew shooting his uncle to reclaim the bride, and then losing her anyway, all of them spiralling into grief and madness. That’s mythology-level storytelling. So if the next episode is about waiting for a ballistics report from the forensic lab, then that’s a huge shift in tone that renders everything else meaningless. For the story to feel satisfying, we have to see a clear connection between who the person is, what they did, and what happens to them as a result. A prison term just doesn’t feel personal enough. Later on in today’s episode, after Joshua brings Millicent up to her room to calm down, he tells Nathan that from now on he’s not allowed on Collins property, including the shipyards where he works. Joshua is also planning to write a letter to the Navy, informing them of Nathan’s misconduct. That’s a satisfying threat, because it arises naturally from Nathan’s personality and his crimes. Nathan is a social climber and a gold-digger, and now he’s lost access to Millicent’s fortune, and to the profitable connections that his relationship with the Collins family brought him. Nathan over-reached, and he ends up with nothing, and that feels right. At this point, we don’t need to read him his Miranda rights. Just hand him a letter opener, and get out of the way. A few seconds later, the boom mic can be seen when Ben walks away from Joshua and says, “I ain’t been near the mausoleum since the day Mr. Barnabas was buried.” The camera quickly corrects, and pans down. Does anyone have any “Edge of Night” tapes they can loan to Danny? ‘Kay, thanks, bye. Yeah, Danny, how could you forget “Edge of Night”? For those young’uns like Danny, The Edge of Night was a soap that ran from 1956-1984 (first on CBS, then ABC) and was daytime’s answer to Perry Mason. In fact, Proctor & Gamble had tried to buy the rights to Perry for daytime and when that fell through, they created this. It was a police/courtroom procedural long before CSI that drew in a large male demographic, partly because of its late time slot, partly because of its unsoaplike premise. During its heyday in the ’60s and ’70s, under writer Henry Slesar, it told gripping mysteries that managed to sweep in just about every cast member on the canvas. Unlike “Dark Shadows,” these were diabolically sturdy stories, dense with character and twists. My personal favorite was the one involving the return of Nicole Drake, a beloved heroine believed lost at sea for over a year. It was a lesson to viewers in being careful for what you wish for. Her return set off a chain reaction of mayhem over the next 18 months that claimed the lives of at least three major characters and several minor ones. You can find on YouTube clips of another great story from the ’70s, the climax of the Josie/Serena split-personality saga, a courtroom unmasking that still holds up. In its last decade or so, Edge starred some guy named Joel Crothers. Yes, I loved The Edge of Night–that was the show I rushed home to see after school (or I would have rushed, if I hadn’t been riding the bus). Henry Slesar’s fifteen-year reign as head writer gave us the brilliant and satisfying plot twists–even when it turned out the character we loved had done it. I still have a letter from Mr. Slesar. He also wrote many short stories and some novels, including “Murder at Heartbreak Hospital,” in which a killer menaces the cast of a daytime soap. I haven’t seen EDGE OF NIGHT, either. Thanks for the YouTube tip! I’m a big fan of soap operas and police procedurals. I prefer the LAW AND ORDER format where we don’t know who truly did it (unlike the spin-off CRIMINAL INTENT), but those series are about snappy dialogue from the detectives as they uncover clues and break alibis. I think to Danny’s point, it’s difficult to introduce that form of storytelling to a soap opera, which tend to be more about grand feelings and emotions. We feel cheated if there’s someone whose emotions we don’t really know. The serial killer storylines, especially, from the Salem Strangler on DAYS to the bonkers “Who Killed Carmen (a character no one really liked anyway)” on Y&R, tend to be unsatisfying for me because the “surprise reveal” involves a character not being who we thought he or she was.This always feels like a betrayal of the “intimate” relationship viewers have with the cast of a soap opera. Not that soaps can’t have surprises — I thought the revelation about Ava Moore in the second season of Nip/Tuck was fine because we were also present with her while she was involved in all her skullduggery. The revelation about the Carver in the third season wasn’t satisfying to me because it wasn’t simply the peeling of an onion, it was the introduction of an entirely different vegetable. I’ve always thought the reason people on Dark Shadows don’t eat more is because they didn’t have enough money to build a dining room set. Oh I would have loved to see the family sit down for one of Mrs. Johnson’s famous boiled dinners. There was the kitchen set but it was too small to comfortably sit the entire family at once though there were the odd breakfast scenes. And I guess the diner setting was also used as a place for people to gather and chew the fat – and lobster rolls. And there was that restaurant in Bangor…..But I guess once Barnabas showed up the more conventional soap tropes just went out the window including the food. There actually is a full dinner table scene during the Phoenix storyline of the pre-Barnabas era, where Vicky, Elizabeth, Roger, Laura, and David are all seated around the dining table in the kitchen having just finished with dinner. There was room for Carolyn at one end of the table as well, but she was absent no doubt because having her seated there would have blocked the camera angle and thus hindered dialog between Roger and Laura. Most likely, the scene was done merely as exposition for the viewer to show that Laura doesn’t actually eat the way that humans do, but instead derives her nourishment and strength from sitting by the fire for hours on end. The scene is notable for its blooper, which appears at 4:22 in an 8-minute 38-second YouTube compilation titled “Dark Shadows–Some favorite moments, lines and flubs”, where Elizabeth and Roger start speaking the same line at the same time, commenting on the fact that Laura hasn’t even touched her food. The full clip is highly recommended for the entertaining manner in which it lovingly strings together similar aspects running through topics of conversation and bloopers, such as the problems they had with doors not closing or opening properly and so forth, providing many hilarious moments overall. It’s a skillfully blended compilation. I also seem to remember that there was a dining room scene all the way towards the start of the show, on the day after Victoria arrives. I really missed the diner scenes when they stopped using that set. There was something comforting with having Maggie serving coffee and sandwiches to the regulars – it felt like an oasis of sanity while the mayhem was unfolding around you. I tended to like the stories where there was some sort of ‘investigation’ surrounding the events going on (i.e. ‘smart Vicki’, Bill Malloy and Constable Carter solving the mystery of who tampered with Roger’s car brakes, Dr Guthrie unravelling the puzzle of Laura Collins’ apparent death in AZ, and even the early investigations behind the attacks of animals and women when Barnabas first came to town. I’m currently watching the 1897 story and while it’s exciting it also feels like a ‘free for all’ at Collinwood. The episodes up until 365 are probably the ones I would mostly watch over again for the detail and focus they place on each event that happens in Collinsport. Also I forgot to mention that the scene of Willie Loomis (initially played by that other creepy actor James Hall) harrassing Vicki and Carolyn while they were seated in the Collinwood kitchen/dining area set was one of the most tense and unsettling moments I’ve seen on the show. Agree. James Hall was super-creepy and the scene where he’s about to attack Carolyn before she pulls the gun on him, is easily one of the most intense in the show’s history. I wonder if Hall had remained in the role if he would have been able to make Willie likeable and sympathetic like Karlen did – cause we only saw the one side to him. And yes, I sure miss that diner set. But I really wish James Hall had stuck around just long enough for the bar fight. It was him I really wanted to see get beaten up by Burke, not poor John Karlen. I used to wonder that too about James Hall, until I realized there was no way he would have been able to remain on the show, what with the way he was continually garbling his lines. His timing for dialogue cues was equally poor. I wouldn’t be surprised if that’s the reason he was fired from the show. For an actor who only appeared in a handful of episodes, he sure made his mark in some of those bloopers compilations you find on YouTube. He didn’t have the theatrical flair that John Karlen brought to the role, nor did he have the versatility required to play the many roles Karlen took on later in the show’s run. You could never picture James Hall as Carl Collins, for instance. As Willie Loomis, James Hall’s interactions with Barnabas would have been a disaster. Karlen skillfully rescued Frid from serious gaffes in several scenes, because fortunately Karlen memorized Frid’s lines as well even when Frid had not. As an uber-sleaze, James Hall had that aspect of the character down, but in the long run the production staff made the right call in bringing John Karlen onto the show when they did. Ditto on the diner set. One of my favorite characters from the diner scenes was the waitress Silent Suzie, who was never given a single word to say in all the episodes she appeared in, but would only smile and nod when spoken to. There was one hilarious scene where she approaches a pair of customers at a table with a menu. Instead of speaking, as a normal waitress would, she merely holds the menu open with one hand, gestures at it with a wave of her free hand, then gives it to one of the customers and just walks back to her place behind the counter. I wonder if customers tipped her less for not speaking while serving them. At least she smiled while giving them the silent treatment. Those clips are very entertaining, but one fly in the ointment for me is that “Take you over my knee” line between Burke and Carolyn. That’s a cliché I’ve always disliked, and in my case, it doesn’t even have much to do with sexism. Instead, I’ve just always found it annoying, period! So it’s one earlier cliché in scenes between men and women that I’m just not sentimental about, even in a DS episode. Danny, one category of crime drama you left out was the inverted detective story, in which we watch the perpetrator commit the misdeed at the beginning and watch as the sleuth closes in. “Columbo” is probably the textbook example of this, with only one episode where there was a deviation into a whodunit story. I heard a podcast recently where it was stated that, from the killer’s point of view, “Columbo” was a horror movie with the detective as the monster, relentlessly pursuing. I really enjoyed the “Who Killed Bill Molloy” murder mystery episodes. It even had scenes showing Sheriff Patterson being very nearly clever. Although, being Dark Shadows, it was much more satisfying having the perpetrator ultimately suffering justice by ghost! Yes. I loved the “who killed Bill Malloy” storyline. 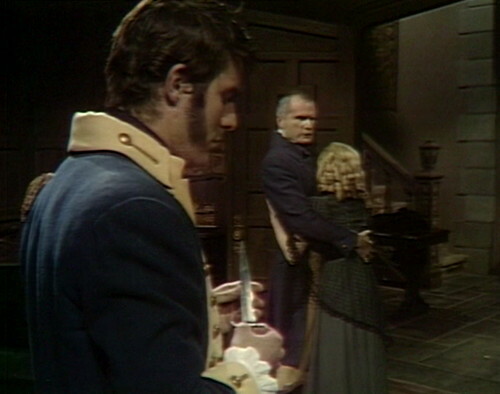 It did move slowly by later Dark Shadows standards, but actually was resolved relatively quickly compared to the incredibly long story arcs on other soap operas. The murder mystery story arcs on “The Young and the Restless”, when written by the late great Bill Bell, sometimes took over a year to resolve! I am very much enjoying Millicent’s loss of innocence and grip on reality. So much better than Angelique’s all powerful, annoying head. If Naomi’s sherry counts as mealtime, then Barnabas’ liquid diet also counts – and he’s getting more protein and iron. What? But it’s 1795…what is this discussion about police and detectives and such? According to the Encyclopedia Britannica, there wasn’t any such thing, which was the vibe I had about it. Here’s an excerpt, but the whole thing is really informative. For me, one of the whole points about 1795 is that it frees the show from having to worry about these processes, which was never its strong point, let’s face it. They are free to depict the insanity and chaos of “justice” prior to the establishment of formal processes, and in a time when justice was dominated by whoever had the power. Still is, I suppose, but these days we have a facade of objectivity created by formal process. I’m not saying I enjoy these court scenes, or anything about the trial sequence, I don’t! But I do find the spectacle interesting and duly terrifying in its total failure to look for proof…and I think they have done a pretty good job of showing an alien world in terms of the processes of justice. Am I the only person who can’t understand how a rich and powerful family like the Collins’ do not have enough servants to open the front door when somebody knocks. Seems like Joshua would be on top of that since he’s all about image. In ep424, just after Josette was brought back to Collinwood and bundled off upstairs, Nathan mentions waiting for the constable; maybe they’re still waiting. Speaking of Nathan, all his scenes are just cracking today. Nancy Barrett ‘s fantastic as usual, and then Joel and Lou have one of those rare shouting matches that’s genuinely intense and gripping (plus Joel looks mighty dashing during the whole thing, with a nice dramatic hairdo). In a much earlier post, Danny memorably observed that on a soap opera with an average of five actors per episode, any character who can tuck in his shirt is presumed to be authorized to investigate a crime or declare martial law any time he feels like it.This seems to apply to justice 1795-style only more so. In the early days of DS there was the confusion over whether the chief LEO was called a constable or a sheriff. I have been reading about a town in Vermont in the 1910s where the same individual is referred to in the local paper as both deputy sheriff and first constable. So maybe the confusion or combination of those kind of titles is not original to DS. While police departments were half a century away, towns in the early days of the Republic did have constables while counties (and sometimes towns) had sheriffs. Good Grief!! I meant “Danny” in my above post, not “David”! 😦 My apologies!